Special guest appearance by Mel tomorrow! Mel the Metro ExpressLanes Van. 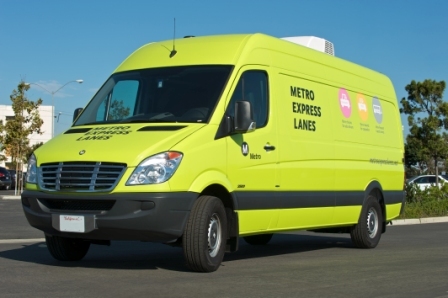 If you don’t have your ExpressLanes transponder yet — and think you will use one — Mel, the Metro ExpressLanes Van, will be out and about tomorrow, setting up transponder accounts on FasTrak®. Visit her at the Farmer’s Market at L.A. City Hall tomorrow, as well as the following two Thursdays between 11 a.m. and 1:30 p.m. at 200 N. Main St. in downtown L.A. 90012. Mell is traveling around the region to bring FasTrak® accounts and transponders to commuters so they will be ready to use the Metro ExpressLanes when the lanes open on the 110 Harbor Freeway on Nov. 10 and on the 10 San Bernardino Freeway early next year. Transponders can also be ordered online.